Your bathroom puts up with a lot, so doesn't it deserve a little pampering? The best part about treating your bathroom to a few luxurious upgrades is that you reap the benefits. If you've always fashioned yourself a lover of the high life, why not indulge in a bathroom makeover shopping spree? Even if you only devote yourself to one of these classy bathroom fixtures, it's sure to make all the difference. Your showers may feel just a bit more relaxing, your makeup may look a fraction better and your floors may stay cleaner just a while longer - all because your bathroom is happier. Consider these four thank-you gifts for your favorite room in the house. 1. A brand new bidet seat. A sure sign of sophistication, bidet seats are also useful and hygienic. What oodles of toilet paper traditionally has trouble with, a bidet seat can make a breeze. You'll feel fresher, fewer trees have to be cut down and typical bathroom functions will never have felt so classy and Parisian. 2. 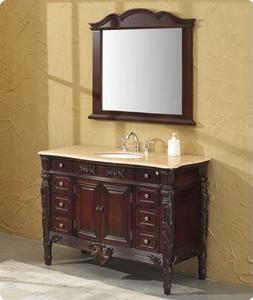 A designer dual sink vanity. Your spouse will be thanking you for this one. While the marital benefits of having two sinks in the master bathroom are obvious, the more subtle aspects of premium design are just as satisfying. Just like a desk, table or sofa, it's imperative that you treat your vanity like the stylish fixture it is. Whether you go with an antique bathroom vanity or something in a more modern or contemporary design, picking out a dynamic style is sure to imbue your bathroom with necessary character. Just because it's where we floss and shower doesn't mean the bathroom deserves any less style or décor than any other space. 3. A luxurious towel warmer. Bring one of five-star hotels' greatest amenities into your home with a stylish towel warmer. These towel bars are specially heated so that your cottony towels are as toasty as can be when you get out of the shower. Don't risk braving the winter alone without one! 4. An eco-friendly toilet. You've done so much for your bathroom, why not give the environment a gift too? An eco-friendly toilet is a fantastic way to reduce the massive amount of water wasted with every flush of a regular john! Opt for helping out the environment and flush-easy options. Besides, these stylish models blend perfectly with the rest of your furnishings and are eager to be equipped with the (also eco-friendly) bidet seat. Change your bathroom habits for the better - and greener!